The knife was prominently displayed in the movie and used in several key scenes. The unique design was an instant hit with knife enthusiasts and the "Survival Knife" was born. Jimmy Lile made 100 serial numbered copies of the original First Blood knife. Numbers 1-13 had 14 saw teeth along the spine. Numbers 14-100 had 12 saw teeth. Numbers 1-6 were stamped "movie knife" and sent to Stallone for use in the movie. It is rumored that all 6 were pretty much destroyed during filming and are stored somewhere in bits and pieces. Originally, Lile kept numbers 7-14 and Numbers 15-100 were sold to collectors around the world for $1, 000 each with a top grain cowhide sheath. Those knives now command prices of several thousand dollars each in those rare occasions when they are offered for sale. Lile's shop also produced 800 unnumbered First Blood knives. The original Lile knives were 13.8 inches in overall length with a 9 inch flat ground blade and a grey bead blasted finish except for the bright edges. The knifes were usually made from D2 steel but some custom orders were made from 440C stainless steel. The hollow handles were also D2 or 440C steel and wrapped with 36 feet of green nylon paracord sealed with a commercial lacquer for protection and waterproofing. All of the serial numbered First Blood knives had a compass in the handle cap but some of the unnumbered knives had the optional "skull crusher" pommel. The original movie sheath was made by Jim Buffaloe but it was reportedly modified by the movie prop people to give it a more worn and abused look. Lile's shop also sold the "Sly II Survivor Knife". These originally sold for $580 and were available in D2 or 440C steel and had a lugged guard. They were available with 6 inch, 7 1/2 inch or 9 inch blades. Other available options included polished edges and the screwdriver guard. The First Blood knife design was licensed to United Cutlery to make factory reproductions of the knife. 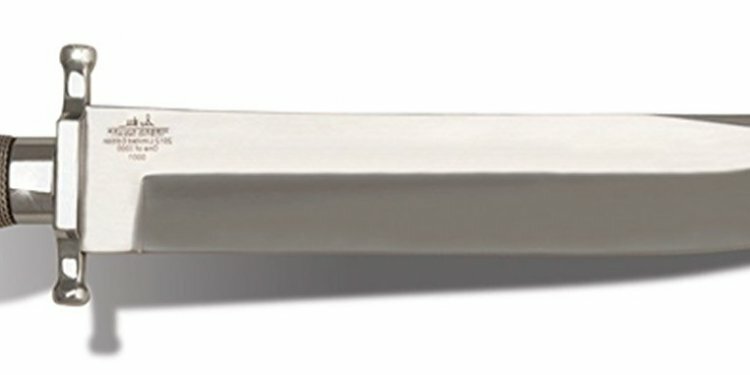 United Cutlery's replica model UC-RB1 is 14" overall and has a 9" long, 1/4" thick stainless steel blade. Jimmy Lile once again made the knives for the second Rambo movie, "Rambo: First Blood Part II". The Rambo II knives are generally referred to as the "Mission" knives since they were stamped with "Rambo The Mission". The movie knives were very similar to the First Blood knives, only slightly larger. They are a little over 15 inches in overall length and have a 10 inch blade. For the movie, they decided to use a black blade with polished edges so the contrast would show well in the film. The blades were available in various finishes such as black with bright edges, gray with bright edges and all gray.